The author might view this burl as an imperfection, enhancing the beauty of its tree. But to a woodworker, the burl’s own imperfection might spoil the bowl he wants to make. A little while back I was on a ferry off the coast of Cape Cod. The seas were a bit rough and I was glad not to be upchucking when I caught sight of two men making their way on deck. Like bookends, these two guys had bald heads, madras shirts and sneakers. I noticed one of the men was helping the other; hand on the small of his back, arm resting on his friend’s. The friend had some crutches, and a glimpse at his footwear told me that walking was not easy, and had never been. The boat was swaying with the waves, and I watched one friend help the other and noticed the laugh lines around their eyes, the gentleness and comfort level between the two. I knew I was witnessing a thing of beauty, people at their best. When I pause and take the time to look, beauty can be found where one least expects it, and sometimes it is highlighted by imperfection. With the salt air circulating in my lungs, I thought of the crab I had found who may have had some close encounter with a seagull. She was missing several legs on her starboard side. But, she had the most magnificent markings of orange on her shell and was carrying an impressive bundle of hundreds of crab eggs attached to her abdomen. Her missing limbs only made her more beautiful. Even in the woods here in our little town there is beauty in imperfection. I see it now as the birds are quieter, and I study the trees. I am looking for those growths attached to the tree, covered in bark, the burls. These strange looking goiters have grown on me, as they do on the trees. Imperfect bulges lurking beneath a covering of bark. Once you start looking, you can barely stop. 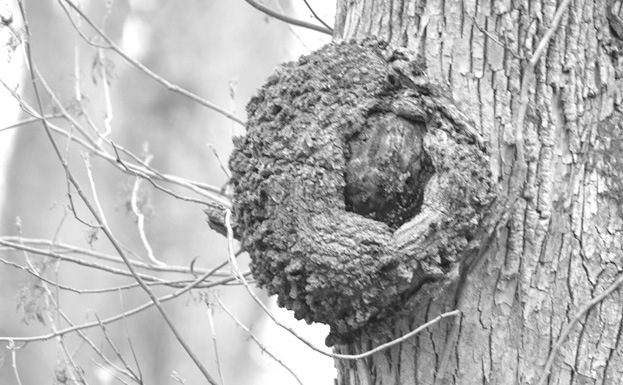 In fact, one of the hot topics of discussion when we hit the trails is where the best burls have been spotted. And, unlike the fauna we seek out, the burls stay put! There are multiple theories behind the exact causes of these burls, but it is agreed that they began from some trauma the tree experienced. There could have been an insect infestation, or a fungal problem resulting in the wood grains growing in a haphazard pattern and sending a bulge outward. While they may look menacing, the burl does not harm the tree, and only adds to its overall beauty which may or may not be in the eyes of the beholder. Continuing with the cliches, beauty is more than skin deep, as is evidenced by the burls. They are coveted by artisan woodworkers as their grain patterns are chaotic with swirls and interesting patterns and colors. The wood from these growths is used in trim for cars, clock faces, bowls and other projects which showcase wood grain. And, if I weren’t so worried about lopping off a few fingers, I might harvest my own burl, to cut in half for my own set of bookends. Just maybe looking at the bookends would remind me of those two men and the kindness that exists in our world, even when we meet rocky seas.